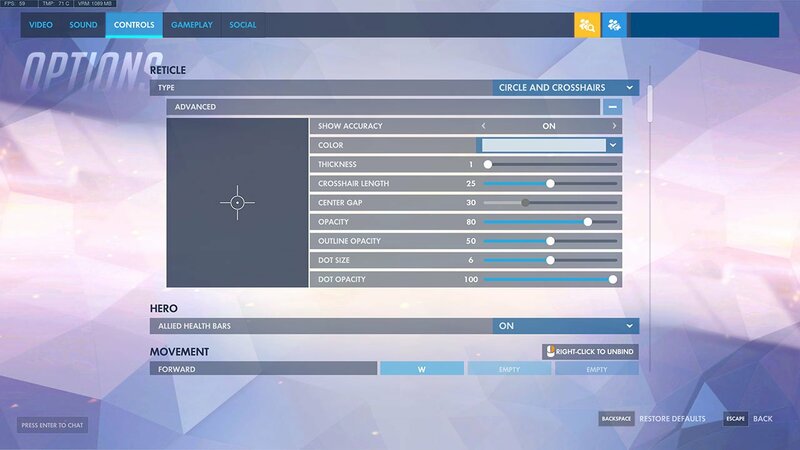 In Overwatch, you are able to change your Crosshair (reticle) between many different designs. The crosshair appears in the center of your screen and indicates where your bullet will hit. Therefor, you obviously want a crosshair which is suitable for you. It needs to be visible against all backgrounds and not block your vision. Overwatch provides a pretty useful crosshair editor. You can change many aspects such as color, type, thickness, opacity, outline and more. Below, we have a quick guide for customizing your crosshair. Whilst we’ve covered many more Overwatch Guides here at PwrDown. 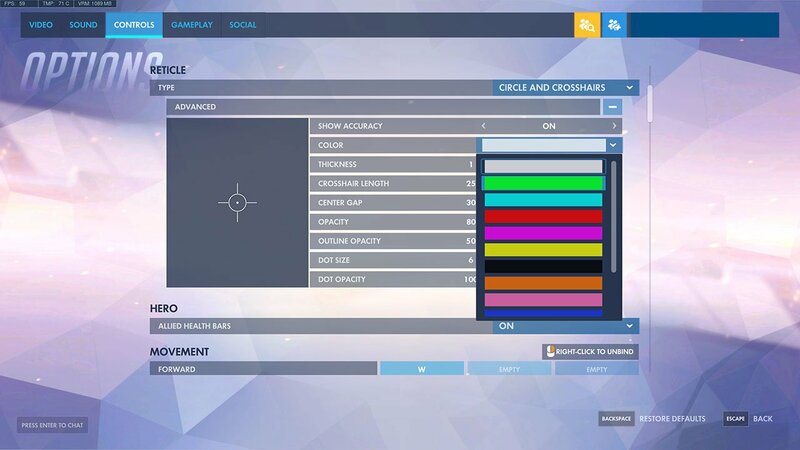 In Overwatch, head into the Options menu from the home screen. Open the ‘Controls’ section at the top of the screen. The first thing you will see is Reticle information. You can start by changing the type, which you will see a preview for on the left hand side. Once you’ve decided on a type, you can begin to really customize it to something that works for you. Mess around with the thickness, gap, opacity, length etc until you have something that you think will help improve your aim. You can then choose a Crosshair Color. There are a lot of choices to choose from, although I recommend you pick a bright one. A good choice will be neon green or yellow, possibly with a black border so that it’s visible against all environments. There is no best crosshair, only one that works for you!